Wheelchair ramps are designed and installed by All-Terrain Medical - your source for quality accessible ramps! If you need a handicapped ramp specially designed for your home, we can help, as we're a disabled ramp supplier who can provide you with a portable or modular wheelchair ramp, with the design made to fit your home entryway. We have the wheelchair accessible ramp accessory to make self-transport a piece of cake! Why not give yourself maximum access to your home, with service from an experienced wheelchair equipment company as well? 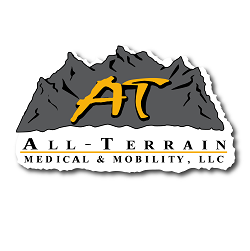 Why choose All-Terrain Medical for your wheelchair ramp? We have the wheelchair accessible ramp accessory to make self-transport simple! Why not give yourself maximum access to your home, with service from an experienced wheelchair equipment company who cares about your mobility? If you're in need of a wheelchair ramp, we're your source for quality accessible ramps! If you need a handicapped ramp specially designed for your home, we can help, as we're a disabled ramp supplier who can provide you with a modular or portable wheelchair ramp, with the design made to fit your home access ways. Order your wheelchair ramp, scooter ramp, or portable and modular handicapped ramps, from the supplier of quality disabled equipment, and just the accessory you'll need to make mobility and personal freedom a reality! We give you ramps and lifts with efficient, state-of-the-art design and construction, so contact All-Terrain today for savings on quality handicapped equipment!